Venu Katta ’17, a research assistant with the Teaching, Research, and International Policy (TRIP) Project, has received the Robert M. and Rebecca W. Gates Scholarship for international study. Katta, a Midlothian, Va. native, will use the scholarship to spend a semester at the University of Nottingham in the fall. “I'm really excited to be able to study international relations from a foreign academic perspective,” he said. “I'm thankful for Chancellor Gates's generous support in this opportunity and for the Reves Center's continued excellence in managing study-abroad at William & Mary,” he added." 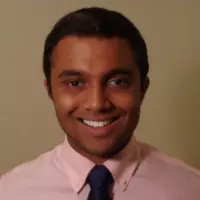 Although only a sophomore, Venu has shown an intellectual curiosity and maturity usually reserved for advanced upperclassmen,” noted Nicky Bell ’12, a project manager for TRIP. “We’re incredibly proud of Venu for this accomplishment and have no doubt that he will bring a great perspective back to campus following his study abroad,” he said. Established in 2012 by Chancellor Robert M. Gates ’65, L.H.D. ’98, and his wife Rebecca, the scholarship is a merit-based award for students majoring in international relations or global studies and is administered by the Reves Center for International Studies.